Mel’s Wax Available ~January 24! Wish me luck! After years of product development and clearing the decks at the Barn on White Run, and finding reliable suppliers for some of the esoteric materials involved (still crossing my fingers on that one), I am thrilled to announce that Mel’s Wax will be in the donsbarn.com Store in the coming days and could begin shipping on or about January 24, 2019. This is a hand-made ultra high performance archival furniture maintenance product, fussy to formulate and manufacture. On a good day doing nothing else I can produce 40-50 jars. But rarely is there a day when I do nothing else. More complete information on the creation, properties and utility of Mel’s Wax will be posted here and at a currently-under-development web site dedicated to it, which will go live as soon as I can get all the documents created for it. Eventually that web site will also include detailed video about using it and other related topics. To give you a snapshot of this product I have posted below some testimonials and the text of the instructional brochure that will accompany each jar. Mel’s Wax will be $49 for a 4 oz. jar, domestic shipping included. A little goes a very long way. Do not complain to me, complain to your state gubmint officials and the environmental trial lawyers they are attached to. Here are some of the comments by product testers over the past couple of years. I do know that [name deleted] has used it quite a bit and likes it. I used it on one commission piece and it worked really nice. It went from really soft to remarkably hard like magic. I cleaned the [artifact] and retouched where necessary then as a final layer applied a very thin layer of Mel’s Wax. She just came back one year later and [Mel’s Wax] helped substantially and though it needs cleaning again but does not have the hazy (ugly) look. My client was very happy! Thank you for giving me the tools and materials to think this through. The pictures I will send you are of a small table that I first polished out with extra fine polishing compound and a wheel buffer. Then I applied [Mel’s Wax] to half of the top, buffed it by hand and compared the two halves. I see a difference between the waxed and un-waxed sides. The waxed side has more luster and gives the surface more depth. There is enough of a difference that would make me reach for the wax on a similar project. [Buffing, Streaking, and Smudging] is where Mel’s Wax excels. My test case is the dining table in this home. It appears to be only a wax finish on the original parts of the top and getting an even shine is difficult. In the past, [another product] was my go-to wax for this job. Mel’s Wax eclipsed [the other wax] in both ease of application and speed in buffing. Best of all, it buffed smudge and streak free–the buffing took a fraction of the time I usually spent buffing out the [other wax]. I found Mel’s Wax to be excellent for prophylactic waxing, especially over already waxed surfaces. I would say that I cut my application and buffing time in half from what I usually spent using [other products] and got streak-free finishes. I still have my arsenal of other waxes for either, jobs not worthy of Mel’s Wax, or jobs where Mel’s Wax isn’t an appropriate choice. I think it would be an excellent household wax as I don’t think it could be “over-used”. 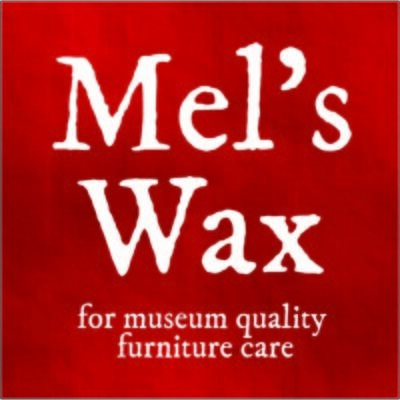 Mel’s Wax is a patented high-performance semi-liquid, easy-to-use furniture care product created by museum furniture conservators for their own professional use. 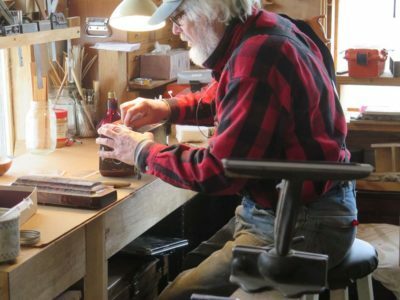 Mel’s Wax is appropriate for priceless antiques, treasured family heirlooms, wooden objects d’art, and even architectural woodworking. Mel’s Wax does not need “elbow grease” for either application or buffing. WARNING: DO NOT USE on food preparation surfaces or utensils. DO NOT USE on fragile or flaking furniture surfaces, or surfaces sensitive to mineral spirits or water. 1. Shake the jar of Mel’s Wax before using. 2. First perform this fast, simple test to make sure that Mel’s Wax will not harm the surface of your furniture. Apply small dab of Mel’s Wax to an inconspicuous area with a clean, soft cloth or cotton swab, making sure that this area has the same finish and appearance as the rest the piece. Gently rub on Mel’s Wax, wait about 5 minutes, then wipe the area with a clean cotton swab or cosmetics pad. You may notice dirt and grime on the swab, but if the test area looks sound and a bit shiny, you can proceed. 3. Apply a small amount with a clean, soft, lint-free cloth in a well-ventilated area. A little goes a LONG way, less is better. 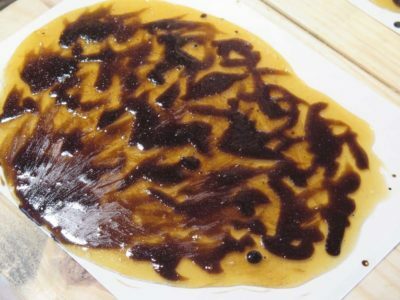 After applying Mel’s Wax you should see an even, slightly glossy residue over the area being treated, indicating you have used enough Mel’s Wax. This gloss may diminish as the polish dries. 4. Wait until completely dry. Generally an hour is sufficient. 5. Gently buff the surface with a second, clean, soft, lint-free cloth. 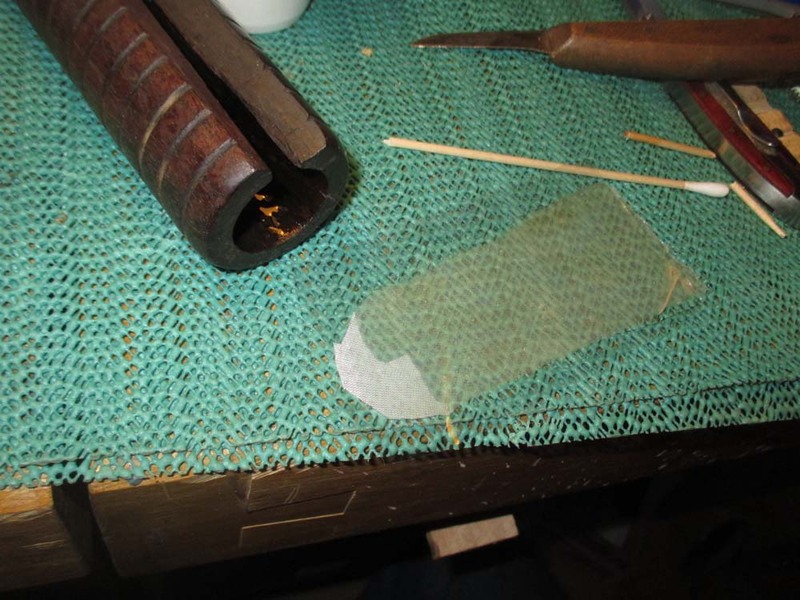 Thorough and gentle rubbing with the cloth is all that is necessary for the polish to produce its luster. 6. Store the sealed jar of Mel’s Wax in a cool place; Mel’s Wax contains natural and synthetic ingredients including petroleum distillate, but no preservatives or stabilizers. Do not let it freeze. Your furniture is now protected and enhanced with Mel’s Wax and ready for storage, exhibit, or use. 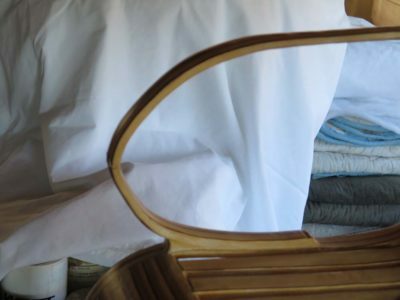 ROUTINE CARE: For pieces treated with Mel’s Wax, ongoing care requires only periodic dusting with a clean, soft, lint-free cloth dampened with a few drops of distilled water. If the surface is dirty, put a few drops of a mild detergent in 8oz. of distilled water and use it to make a damp (not soaking wet) cleaning cloth. Then wipe using a second clean, soft, lint-free cloth dampened with distilled water alone, and finally wipe with a third, clean, dry, soft, lint-free cloth. For furniture in daily use you may have to re-apply Mel’s Wax every few months. If your furniture is not often handled or used, you may not need to re-apply Mel’s Wax for many years. DISCLAIMER: Follow all directions above. Mel’s Wax is not a substitute for a furniture finish. It has been designed as a museum quality maintenance coating to preserve a wide variety of existing furniture finishes. It is not intended for high-stress surfaces like wooden food-preparation counters or utensils, or floors. If the surface still appears “parched” after buffing, the problem is likely with the artifact’s surface. SAFETY/CAUTION: Mel’s Wax is a chemical product, not intended for human, animal, or plant consumption. Apply in a well ventilated area while wearing eye protection. Wear non-latex surgical-type disposable gloves when applying Mel’s Wax or wash your hands afterwards with soap and water. Keep out of reach of children. Dispose of any materials used for applying Mel’s Wax as you would any other household cleaning products. This is an archival quality product which will protect the surface finish of your furniture, thereby preserving the finish while the furniture it remains in careful use. Mel’s Wax has proven to be an excellent product for furniture in typical domestic use. It provides a durable lustrous appearance, easily maintained with gentle dusting and cleaning. Each ingredient of Mel’s Wax was selected after careful scientific review, and Mel’s Wax was formulated to enhance ease-of-use and reduce any harmful effects to artifacts that can be caused by many commercial furniture care products. 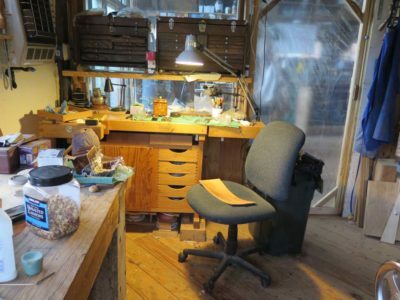 Since setting up my studio in the barn more than a half dozen years ago I have concentrated my small objects d’art conservation projects and related fine work on a tiny Sjoberg workbench in the corner underneath the propane wall furnace. 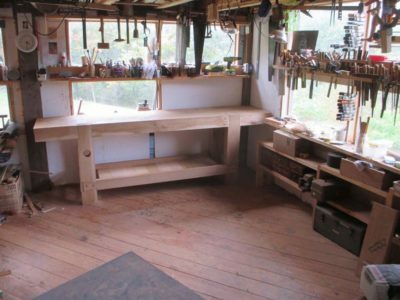 Over the past year I have increasingly gravitated a variety of work to the massive French Oak Roubo Project workbench I began five years ago and finally got it assembled this year and placed on the opposite wall underneath some windows. In the past couple of months I’ve found the little Sjoberg to be too constraining and am working almost exclusively with the FORP bench. 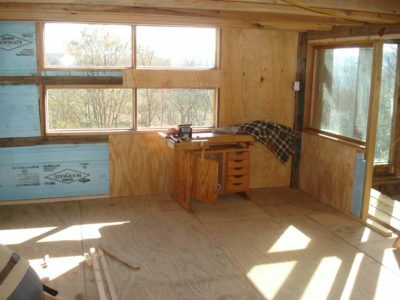 Yes, it was originally designed and built with heavy-duty furniture making in mind, but my comfort in using it this way is a revelation, and working in front north facing windows is spectacular. Back at home after GroopShop 2014 Bill continued to assemble, finish, and augment the folding portable workbench we had built as a demo for GroopShop. After installing the folding diagonal leg braces he gave it a trial run and found it to be too light for his tastes. Plenty sturdy enough but too light to work with comfortably. 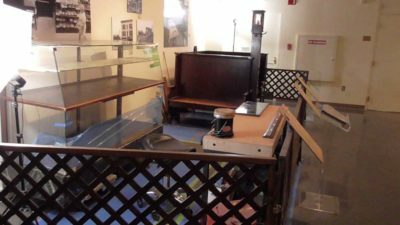 So, he made a shelf to fit between the lower cross braces of the legs and serve as a storage space, clearing the space around the bench and adding mass to the overall unit. The shelf was made using the exact same technology as the top. Like the top it was amazingly light in relationship to its strength and utility. One of the really cool features is that the shelf fits neatly in between the folded legs underneath the top. As you can see he even has room for a second shelf if ever one is needed. 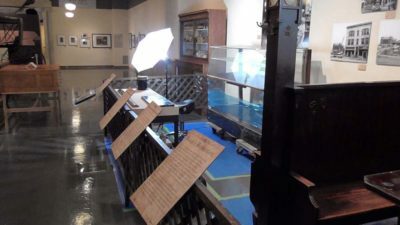 After painting the leg units black, it was going to be used in a museum gallery after all, he set it up and found it to fulfill his needs precisely. I don’t think he ever found the need to install the vises, but the set-up for them remains in place and ready to go any time he needs it. 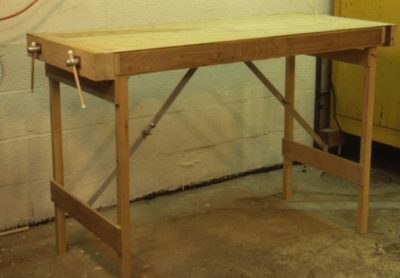 I believe he uses it regularly as a wonderful assembly table in his own shop, ready to be folded up and easily transported to a new on-site project where it is needed. Sometimes improvement occurs as a flash of inspiration, sometimes through an incremental grind. This bench concept was a bit of both, and the improvements I made in this version carried over into the next folding workbench model, which I believe is workbench #20 or 21 in the series. I will be recounting the changes in great detail. I do not have a workbench problem. 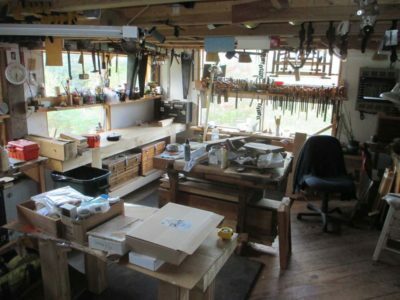 I have a lot of workbenches. Big difference. Recently I was making a presentation to a group and afterwards one o the attendees approached me and told me that he enjoyed my youtube video, As he described the video I was perplexed until I realized it was not my video, it was from The Getty Conservation Institute, a video of a presentation I made almost a decade ago. I was mighty pleased with myself when the bench was finished. It was easy to move, easy to set up and take down, good and sturdy with great clamping. Clearly, I had solved all the problems which led me down this path in the first place. However, a little use of the bench showed me that reality was slightly less idyllic. Unfortunately, its lightness (55 pounds) which was such an asset in my master plan for the “perfect portable bench” was also a big liability once the bench ceased being mobile and was set up as a work station. The bench was so light I couldn’t really work it hard without moving it or even knocking it over. I had to figure out some way of weighting the bench while in use. My “no loose parts” vision was about to bite the dust. Fortunately, the solution was as simple as building two thin (approx. 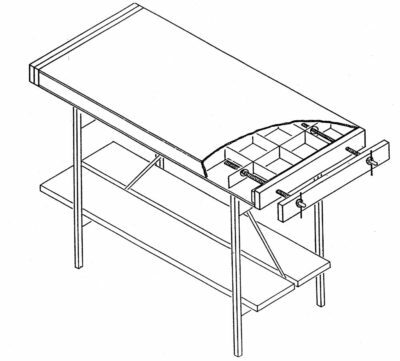 1 1/8″) torsion boxes to serve as shelves resting on the crossbar of the end/leg units on either side of the folding bracket, and which could be attached to the underside of the benchtop when not in use. By putting all my tools and supplies on the shelves, the bench now had enough mass for my use. It still wasn’t heavy enough for general cabinetmaking, but it was more than adequate for restoration. Then a second problem cropped up. 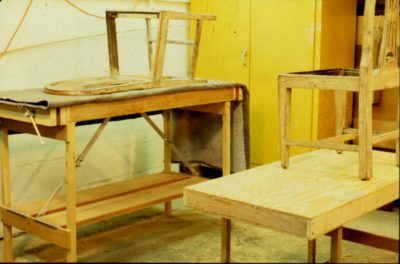 The working height for flat-ish or small objects was great, but setting chairs or case pieces on the bench raised them too high. For these taller pieces I needed a lower work surface which would still fit my ideal of lightness and strength. I could have built a lower version of the bench, but instead tried something different. 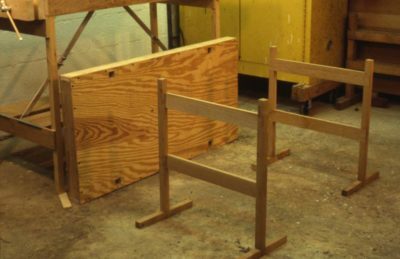 This time I fabricated a torsion box about the same size as the bench top which would fit on a pair of small, low trestle horses. These trestle horses were made from lighter than normal elements, for example the main components were 1″x 1″ and the crosspieces 3/8″ thick. Some minor modifications to generally employed designs yielded another light, strong and stable unit. 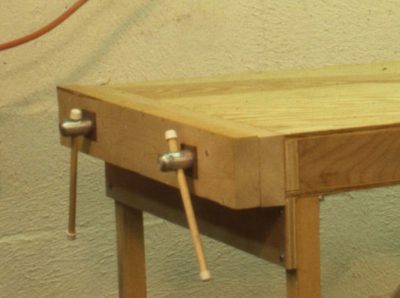 By making the top bar of the horses removable, each post of the trestle could then become a tenon. 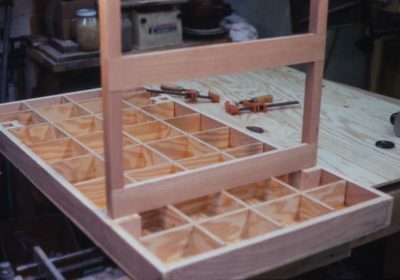 Constructing the torsion box in such a manner that the bottom side had openings to function as extensions to the mortises already incorporated into the grid fitting the tenons of the sawhorse posts, the pieces fit together as a small worktable suited perfectly for holding taller pieces at a more comfortable height. While this new unit was not as “neat” as the workbench, it solved the problem. 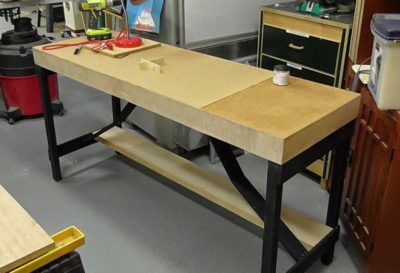 It also provided more flexibility than simply building another, lower table/bench. This saga does not end here as I continued working on newer iterations of the concept, but those episodes will be recounted in future Workbench Wednesdays in a few months. Next week – A derelict salvaged from the trash heap that was transformed into a little jewel. 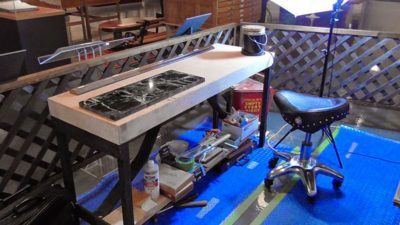 Building on what I learned from the initial prototype of the portable restoration workbench I charged ahead with a “final” version. I say “final” in quotes because this concept is one I have continued to tinker with even to this day, and a late entry in this series four or five months from now will focus on the most recent one. For this first final version I used the same structural strategy for the top, modifying the stock weight being the only real modification. 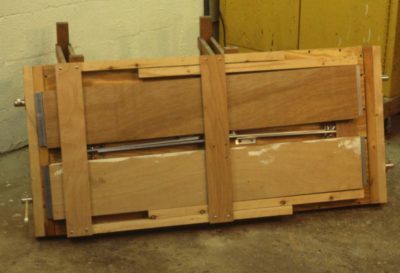 On this second iteration I used 3/8″ A/C plywood for both the faces and ribs of the torsion box top rather than 1/4″ and 3/4″ luan for the same purpose on the prototype. 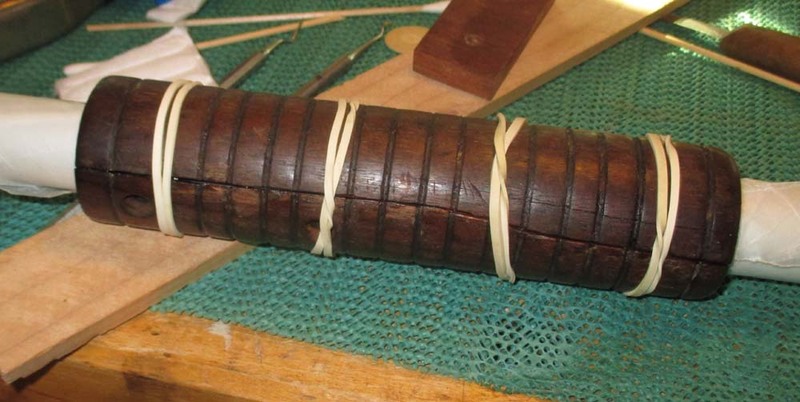 Making the box approximately 3″ thick and placing the ribs in a 6″ x 6″ grid achieved a satisfactory result with essentially no change in weight while yielding a stout structure. In fact, I could do some pretty serious joinery and carving on the bench, which I couldn’t do with the prototype. 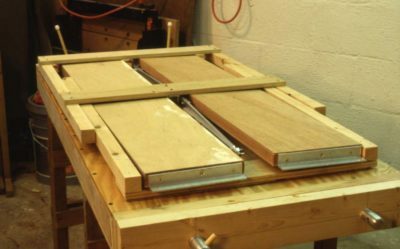 I wanted a large-capacity vise on my bench, but there was no point in defeating my original purpose by building a lightweight bench and then installing a heavy vise on it. 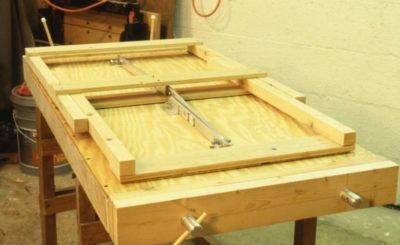 The vise(s) I built opens about 12″ and employs aluminum threadstock for the screws, tapped holes in the endpiece of the top, and 2″ x 3″ x 24″ wood jaws. The screws pass through same-sized holes in the movable jaw, and terminate in simple wooden handles passing through holes drilled in the ends. One pretty dramatic change in this function was to switch from standard steel threadstock to 1-inch aluminum rod stock that I had cut at a local machine shop (I already had the aluminum rod stock in my scrap barrel). It’s been a long time since this project but I recall paying $25 for the job. All it took was to set up the pieces in the lathe and cut the threads with a single pass, along with a single groove above the threads for some retaining collars. I’m guessing it took ten minutes maximum, so $25 for a quarter hour of machine shop time sounds about right. It might have been $25 for each pair of screws, but either way it seemed pretty reasonable. My procedure for incorporating the vise into the bench top involved drilling oversized holes in the internal grid but not the added fixed jaw, so I couldn’t assemble the box all at once. 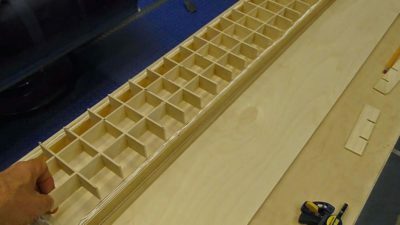 I cut my grid pieces and glued them to one face of the torsion box using 315 gram hot hide glue, which was the adhesive employed throughout the project. After laying out for the vise screws, I drilled holes through the fixed jaw (the torsion box end pieces) to tap-out and received the threaded screws. I was unsure whether holes the same size as the aluminum rod stock used for the vise screws would be large enough to allow the screws to go through the grid members, given the inevitable wobble in the screws. 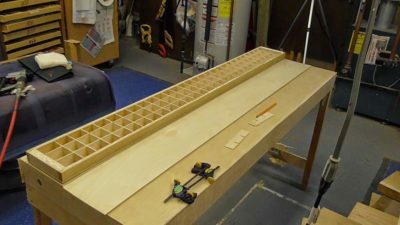 To be on the safe side, I drilled larger holes through the grid to a slightly longer distance the desired vise opening dimension. The vise screws would then pass through these openings as the vise was closed. After I was sure the vise was fully operational, I glued the second face on the grid and the top was complete. 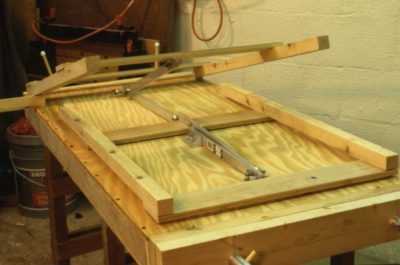 By fabricating simple leg end units with long folding diagonal braces, the problem of too much shimmying parallel to the long axis was overcome on the final bench. 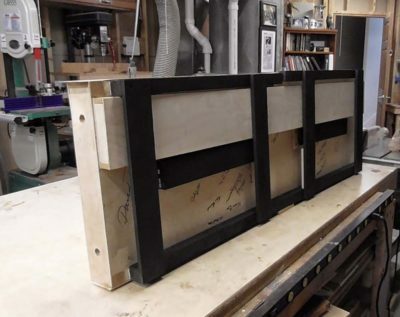 The leg units were fabricated from the clearest 2x construction lumber I could find, and the folding braces from 1/4″ x 1″ aluminum bar stock with 1″ x 1″ aluminum angle stock for the mounting brackets. The slightly heavier face plywood made it easy to screw all these elements to the underside. The leg units were not installed symmetrical relative to the short axis, but rather were off-set by half the leg width so they could fold up next to each other rather than on top of each other. This way, the table could become a remarkably compact unit which needed absolutely no assembly or disassembly; it could just be folded up. Following final assembly I added a snap-on strap for carrying the bench like a large suitcase. By throwing the strap over my shoulder, I could easily carry the bench for long periods of time and maneuver it through pretty tight quarters. The first pair of considerations when designing a conservation treatment plan for an artifact, in this case my own Gragg Chair, is to weigh the nature and needs of the artifact versus the nature and needs needs of the user. 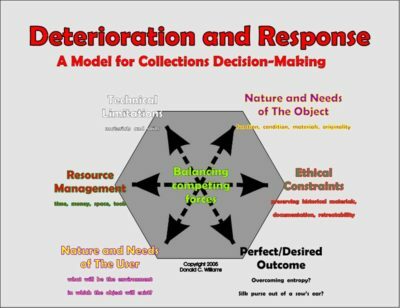 Without comprehending the location of the artifact on the entropy time-line and achieving user buy-in no process can derive a balanced response to the damage being addressed. As a property rights absolutist I am fine with that; if you own a priceless treasure and choose to incinerate it in the front yard, so be it. Short of that, there is a wide range of locations for the fulcrum of this competing pair. In the case of this chair the continued existence of it in its current form and condition was not really in doubt, only one or two of its functions. 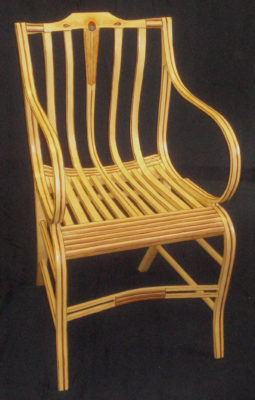 The chair could be left completely unattended and remain “as is” for decades or centuries as a thing, but one of the primary functions of this particular chair form and presentation, namely that it is a comfortable and beautiful thing, was compromised due to the breaks and attendant distortions of the arms. That damage, and its disruption of the chair’s “beauty” is a real and meaningful void in its current “function” and regaining that beauty is not a whimsical undertaking. As for the nature and needs of the user there is far more variability in both theoretical and practical perspectives. In the case of a chair, the user may need for it to actually be functional as a structure that can support a grown adult for the chair’s intended purpose: to be a chair. Or, the user (owner) may prefer for it to be an antetype, prototype or example of the generic or specific chair form, or that it simply represent the form and historical attributes of this particular type of chair. 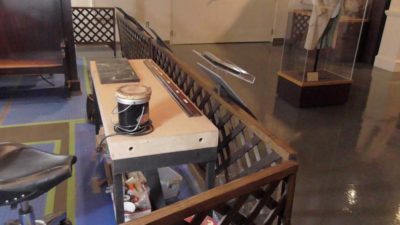 If, for example, one of the legs were missing altogether but the user’s desire was to preserve the remaining fabric as-is, the fabrication of a plexiglass support in place of the missing leg would be entirely defensible. This is not some bar stool, this is an aesthetically sophisticated and technically refined form, one that is both artistically notable and historically significant. Its current damage reveals — at the very least — a failure of its maker to anticipate the stresses that might be paced on it in “normal” use and his failure to accommodate those stresses in its structural design or manufacturing execution. (True enough, I did not anticipate the unauthorized use of the chair by a morbidly obese person and the damage that would result from his frenzied effort to extricate himself before I returned to the booth) From this context the user may choose to leave the static damage exactly as it is as a painful reminder of that failure. In this object vs. user consideration, more than with the coming two pairs of contending concepts, balancing the needs of the chair with the preferences of the user results not at a single point of agreement or strategic objective (or one and only one “exact” way to proceed) but a continuum of options that can respond to both competing needs to some degree. 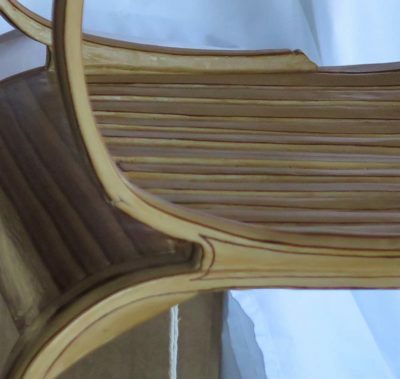 One of the projects that has been slowly percolating up the pile of “To Do” projects is the repair of my own Gragg chair, built several years ago and damaged while on display at a woodworking event when a corpulent fellow wedged himself in the chair (uninvited) and broke both of the curved arms when desperately extricating himself from it. As I cogitate on the project of repairing the chair, even though it is my own piece and I can build another (actually I am beginning to build three more which will be recorded for a future video), I am approaching the problem as though it were a museum/historic piece and this is the execution of a conservation treatment from a formal/museum point of view. In so doing I will be employing and implementing the decision-making model I devised almost thirty years ago, consisting of six separate questions, linked in opposing pairs. This model has served me without fail during my career in the museum, and for clients outside the museum. It has become such a part of my thinking that it almost does not register with me any more. I am hoping that as I work through this series I manage to include all the connections, but if I do not please let me know. The strategic path for any particular conservation treatment depends on the answers to these six questions, and on balance the six answers makes that path clearer. In some cases the questions are not relevant and can be discarded, but they must be contemplated at least to the point of making that determination. The first pair of questions is, What are the nature and needs of the object, and, What are the nature and needs of the user? While this pair is essentially a conversation between me, the advocate for the artifact, and me, the user, I hope it does not devolve into slapstick. The second pair is, What are the technical limitations you are facing (particularly regarding the materials), and, What is the perfect, or least most desired, outcome? And finally, What are the ethical guidelines for intervening with the object, and, What are the resources available for the project? While the context of every object and circumstance is unique, and thus the balance of the answers can vary widely, nevertheless I find the exercise to be a powerful tool for plotting a route from Point A (where or how the object is currently) to Point B (where the object needs to go/be). In coming essays I will address each question (and answer) individually and in concert with its counterpoint question as I elucidate the chosen strategy for dealing with the project as a whole and individual procedures and choices within it. We may find ourselves in pretty deep weeds from time to time, but at least you will know how I approached the problem. I’ll close this essay with the reminiscence of the first time I presented this decision-making model at a national professional meeting, I think in the late 1980s. In a somewhat unusual response from a “sophisticated” audience, I heard occasional hisses and boos during the presentation which directly challenged portions of the prevailing museum/conservation orthodoxy. Over the following three decades there came to be a sporadic and gradual acceptance of the model, and by the time I bolted for the boondocks this graphic was seen on the walls of museum and private conservation labs from coast to coast. With the first split successfully re-integrated it was time to turn my attentions to bringing it all together. Since the previous damage(s) resulted in enough loss to the fracture margin the two pieces would not align perfectly, I needed to bring them into proximity using shaped cauls. My first attempt used a plaster mold made along the outside of the larger piece. I simply wrapped the wood piece in shrink wrap and cast plaster, hoping to use the resulting piece as a clamping and aligning form. I just was not happy enough with the result. Instead I used the actual tubing from the gun, around which the pump action made the forestock slide back and forth along the tube. 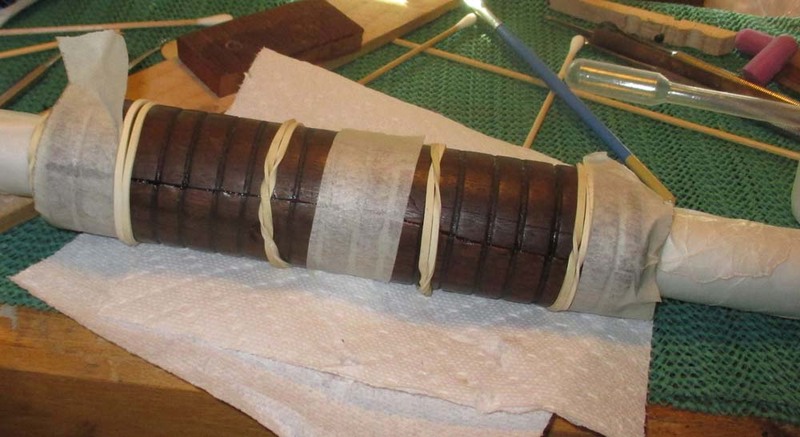 To make sure I had the right amount of clearance, and to provide the perfect clamping form, I wound the tube with three layers of waxed paper. This worked perfectly. 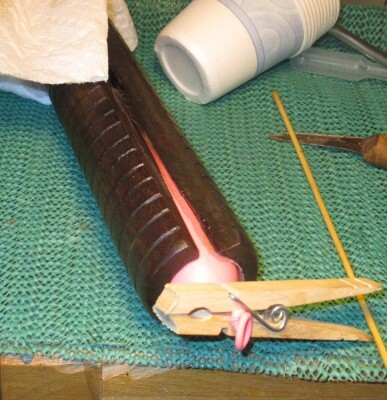 Putting the wrapped tube inside the larger of the two broken pieces, I brushed the West epoxy onto both gluing surfaces, the placed them in contact with each other. Using rubber bands I gently moved the two pieces into the closest configuration possible, and when that was accomplished I used some small pieces of masking tape to hold everything firm, and let it sit overnight. The next morning I mixed a small amount of epoxy and added some more to fill the voids in the break. The following day I smoothed off the excess epoxy with dental tools and needle files. The result was acceptable. To add an additional level of robustness to the stock I prepared a piece of nylon sheer drapery to served as a “bandage” on the inside of the repaired split. When it was ready to apply I brushed some epoxy on the inside wall of the forestock, then saturated the “bandage” while it was sitting on a piece of mylar then moved it into place. With the small sheet of mylar and the epoxied bandage in place, I used a tube balloon, inflated in situ, to provide the necessary gentle pressure to make sure the epoxy saturated nylon sheer was in direct and intimate contact with the surface. When I dismantled the glue set up the next morning I was delighted to see that it was successful. 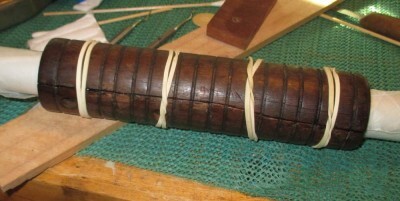 A minute with some fine sandpaper wrapped around a large dowel to smooth the inside surface and the structural repair was completed. 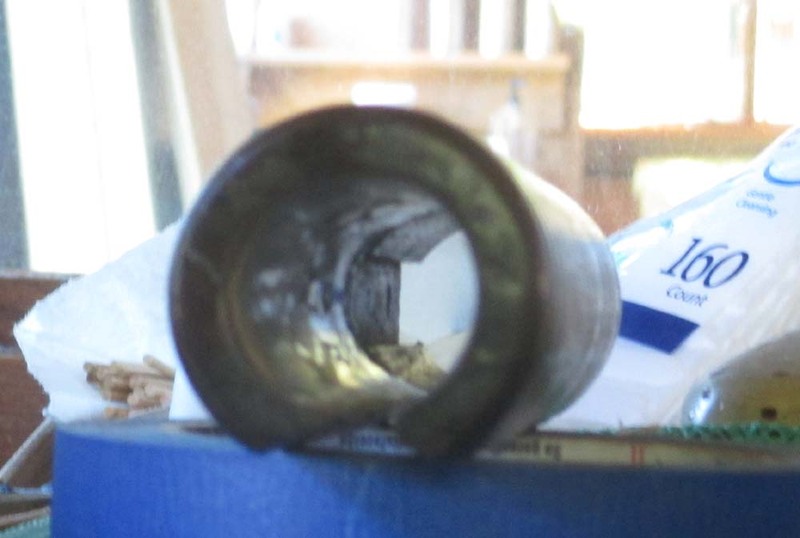 The salvaged forestock slid perfectly up and down the tube. 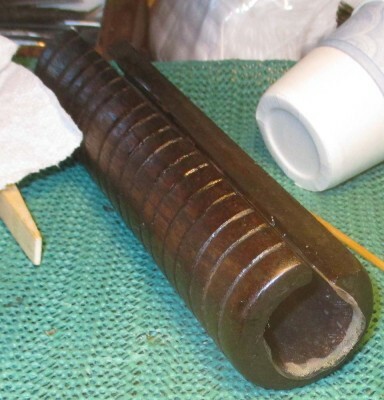 To be in concert with the restoration of the other parts of the shotgun, I lightly cleaned and sanded the outside of the re-unified forestock before applying a couple coats of Tru Oil finish. I returned the repaired piece to Bob and he was delighted with the end result. He will complete the coatings homogenization.